HOW DO YOU MAKE A GAME ABOUT THE GREAT CITY OF CHARLOTTE, NORTH CAROLINA? While it's impossible to include everything, we jammed all the Charlotte we could into this box. It's full of fast cars, barbecue, even a dragon - a little something for every Charlottean! Looking for a fun way to experience The HORNET'S NEST?HERE'S A QUICK IDEA OF HOW TO PLAY! 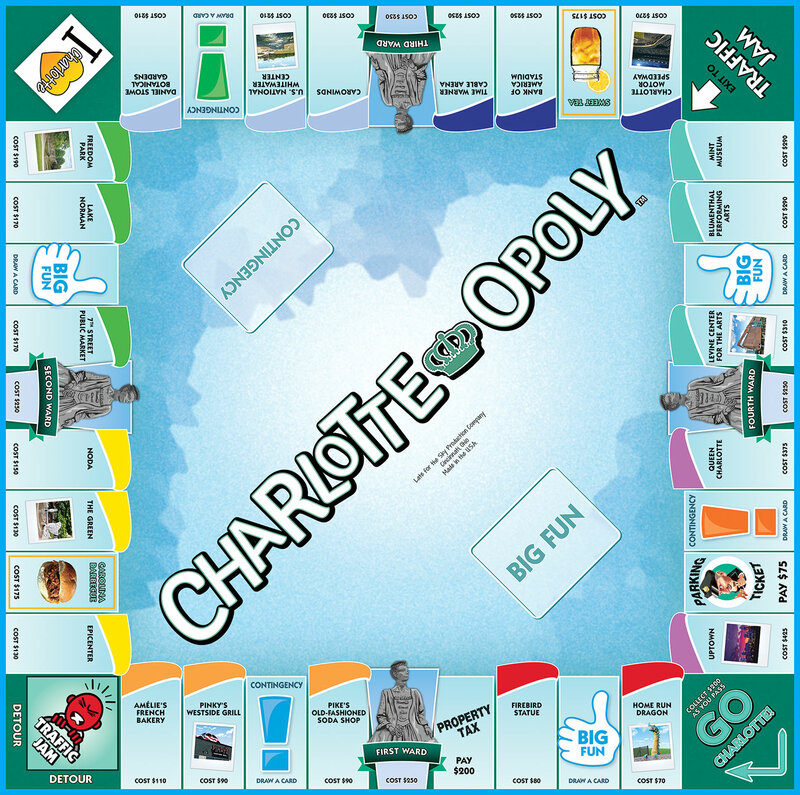 Buy your favorite CHARLOTTE properties, increase your rent by collecting City Blocks and trading them in for Keys to the City. Sound easy? Well, add in some traffic jams, property tax and parking fines and it gets a little more difficult and a lot more fun! GET YOUR GAME ON! So choose your token and advance to GO CHARLOTTE! You may soon be watching the full-throttle excitement at Charlotte Motor Speedway... or eating too much at the Queen's Feast! THIS IS CHARLOTTE AND IT'S YOUR ROLL!